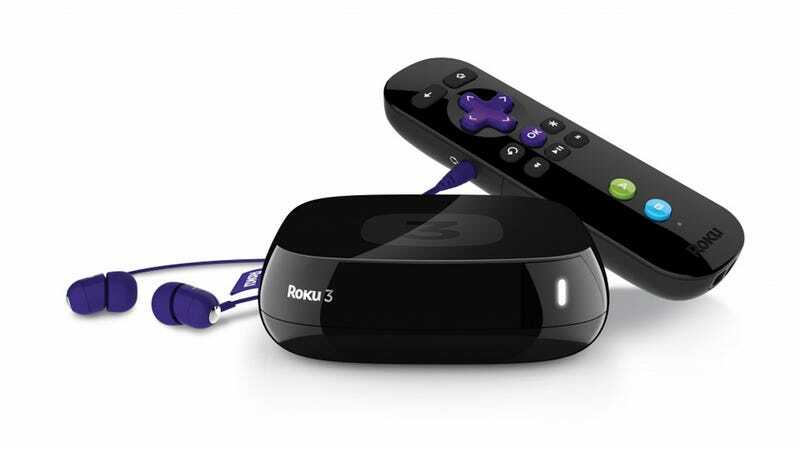 The best little streaming black box just got a spanking new model: the Roku 3. The slightly updated design adds a few curves to the square black box design and also throws in an updated user interface, a much faster processor and even a private watching mode that uses wireless audio from the remote control. Yes, the remote control has a headphone jack. The new grid-based interface looks to be a lot more useful with more easily accessible icons shown on one screen. Less scrolling, more watching. It's just as easy to use as Apple TV's icon-heavy interface but there are large advertisements for certain shows/movies that quickly get annoying and waste prime space. However, Roku 3's new interface does make it easier to add channels (the Channel Store is integrated in the main menu) and its guts make it five times faster than the old Rokus. The Roku 3 also has dual-band Wi-Fi. What's kind of clever about the new Roku 3 is that it lets you watch shows in a 'private mode' (or wireless audio mode). You can plug in headphones into the Enhanced Remote's headphone jack and Roku will mute the TV and push all the audio to the headphones. That way if you're burning the midnight oil blasting Game of Thrones in your living room, you can keep the rest of the house asleep by just putting your headphones in the remote control.